Brass is an alloy (mixture) of the two metals copper and zinc, consisting of approximately 70% copper and around 30% zinc. With respect to colour, brightness and lustre, brass (when freshly polished) bears a strong resemblance to gold. Not only for this reason our brass exhibition was given the subtitle "The Gold of Stolberg". From the late 16th. until the end of the 18th. century, brass making was a "Golden Trade" which brought the manufacturers in the valley of Stolberg prosperity and wealth. Nowadays, brass is made by melting together the two pure metals copper and zinc. Until the late 18th.century, however, pure metallic zinc was neither available nor even known. The alloy had thus to be made by utilizing calamine, a zinc bearing ore, mostly consisting of zinccarbonate or smithsonite. 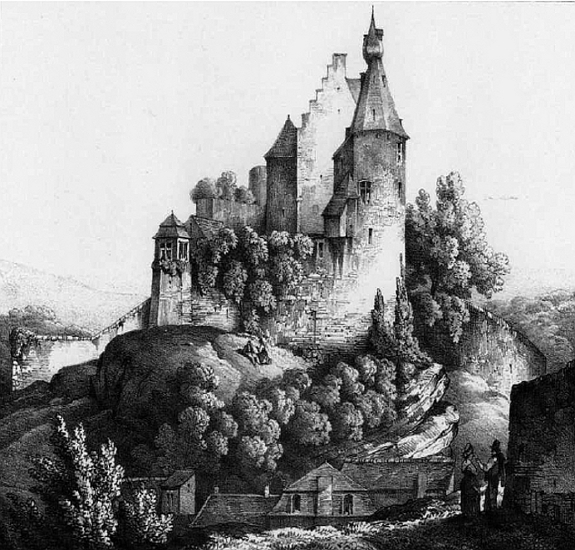 The geographic location of and the geologic situation in the region of Stolberg allowed brass production at a very early time. Whereas the local ores were already exploited and utilized for lead and iron smelting in celtic times, brass making was obviously started by the Romans in the first century. In the archaic process of brass making, crushed and pulverized calamine as well as pulverized charcoal together with pieces of copper were given into crucibles. At temperatures between 900 and nearly 1000 Degrees Centrigrad the carbonate of the charcoal reacted with the oxygen of the ore, since air was not available in the crucible. The blaze in the furnace prevented the oxygen content of air, which is necessary for burning, to reach the charcoal. 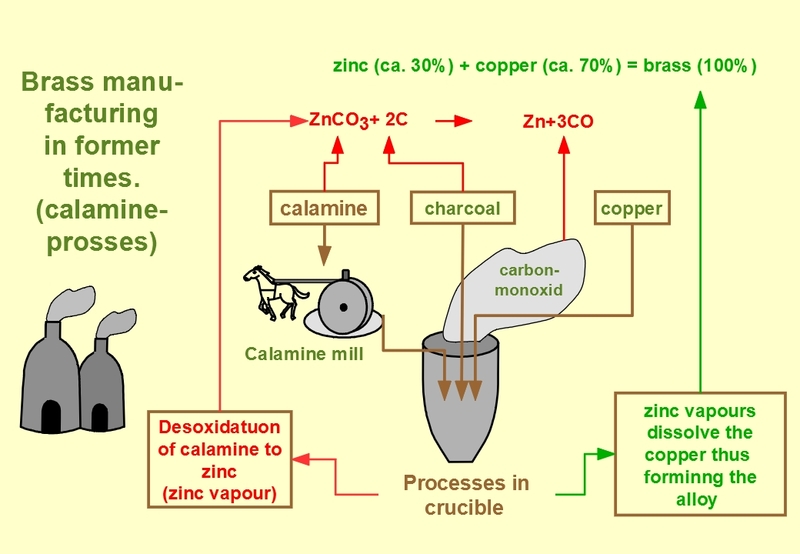 This process is commonly termed reduction (deoxydation), meaning that the calamine ore is reduced to zinc. Or more generally: The metallic zinc is separated from the ore. Since temperatures between 900 and nearly 1000 Degrees Centrigrad required for this process, were well above the evaporation point of the zinc this metall was set free as zinc vapours. These zinc vapours dissolved the still solid copper, thus forming the alloy. In this process, the required quantity of zinc ore was twice as high as the required copper weight. Consequently, brass making was almost exclusively restricted to areas with calamine deposits, as we had in Stolberg. In Roman times for instance, when the so called calamine-process was utilized, the price for brass was several times higher than the price for copper. A good example of Roman brass is the so-called “Hemmoor bucket”. In most cases these buckets were decorated with a frieze, originally garnished by inlaid enamel and silver. The term “Hemmoor bucket” is certainly misleading, if not inadequate, because these bowls were definitely not used as buckets. On the contrary, they were precious pieces of household goods, representing a status symbol for wealthy, well-to-do families. In our region, the Roman brass tradition found its succession in the 16th, 17th and 18th century, when the local “Copper Masters” (Kupfermeister) dominated the European brass market. Although a stretch of several centuries elapsed between the Roman brass manufacturing and the era of the Copper Masters at the beginning of modern times, the technology of brass manufacturing remained exactly the same. Quite surprisingly, the brass manufacturers were called “Kupfermeister” (Copper Masters), and not Brass Masters, as would have to be expected. As already mentioned, the zinc content of the brass alloy initially emerged in a vaporized condition. When taking a crucible out of the furnace and inspecting its content, the zinc could never be seen. The zinc vapour immediately escaped and reacted with the oxygen in the air to zinc-oxide, a white powder. Indeed, pure metallic zinc was completely unknown at those times. In consequence, copper as well as brass were both called copper. For a differentiation, the terms red copper for the pure metal and yellow copper for brass were commonly used. Likewise, the brass manufacturers were also called “Kupfermeister = Copper Masters” and not brass masters as one would expect today. After the alloy had finally been prepared, the liquid brass was cast into a stone mould to form brass plates. The moulds consisted of a pair of stone blocks (granite) with an iron frame placed between lower and upper ashlar to provide a gap for filling in the hot alloy. Water powered, mechanical hammers were used to transform these massive brass plates into thinner sheets (rolling mills were not yet known).Water power was also needed for crushing the ore and to run bellows for blowing air into the furnaces. In addition to calamine one needed water power to hammer out the metal sheets into final products such as plates, kettles, jugs, bowls, etc. In the 19th. Century, the process of forming brass bowls changed to another method. Instead of being hammered out, they were now formed by using a mechanical device similar to a lathe. A tool with a rounded head pressed the circular, rotating brass sheet against a wooden or iron model. Even today, the production of brass or rather the production of all kinds of copper alloys is an important factor in Stolberg. Three major companies are still manufacturing semi-final and also final products. A rather particular example for this has been the introduction of the Euro as common European currency. A substantial amount of blanks for the Euro coins were and are still manufactured in Stolberg and sent to the various European mints. Especially during the 18th century, the trade of brass making brought prosperity and wealth to the Copper Masters. Even nowadays this becomes evident when looking at the former Copper Yards, where the Copper Masters resided and produced brass. Whereas the factory buildings are either gone or have been modified, the manor houses give a good impression of how the wealthy families resided at those times. Initially the Copper Yards were built as fortified, defensible constructions. Typically they consisted of a small yard, completely enclosed by sturdy buildings. For protection reasons the outer walls did not have windows at all. Very often however, you could find embrasures. Anyway a Copper Yard had not an inviting appearance at those times, at least not from the outer side. And that is not at all surprising, we just have to remember, that most of the early Copper Yards were erected during the thirty year’s war. However, some of our Copper Yards were built around 1700 or even later. And these had an altogether different appearance. Actually they were representative mansions often surrounded by splendid gardens. Whereas the gardens are gone by now, the buildings are still standing. But even today the former splendour can easily be recognized. There are two reasons for this surprising change in style. To begin with, times had become much safer and fortification was obviously no longer required. Even more important, the Copper Masters had become wealthy enough and could afford impressive buildings.